Great Ford Galaxy car Leasing & Contract Hire Deals. Ford brings us a fourth-generation version of its Galaxy seven-seater and this model boosts safety, is more efficient and brings an innovative third seat folding system. With a wide range of engines and improved interior quality, this one's going to be at the top of quite a few family shortlists. 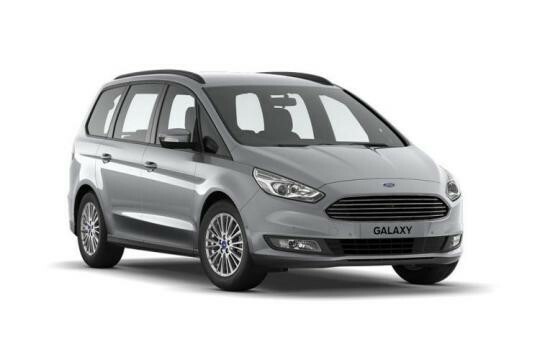 Our Ford Galaxy Lease Deals. This model's always been one of the very strongest contenders in the large MPV segment and early signs here suggest that this MK4 version still is. All of the key areas for improvement that were identified with the previous version seem to have been given a good ticking, with a sharper look, better interior quality, slicker technological integration and a richer array of high-tech safety features. All of these things are present and correct. Under the skin too, this fourth generation model seems to have been made from the good stuff, its extended platform and clever rear suspension teaming with a broad range of engines to offer drivers something a bit different to usual dull MPV driving experience. Building a big MPV is all about managing compromises without taking your eye off the prime consideration, that of safe and spacious family transportation. Ford has, down the years, been a bit cleverer at figuring out those compromises than most of its rivals. In short, the Galaxy looks as if it's setting a very high bar. Ford is offering this car with a 2.0-litre TDCi diesel engine in various forms. At the top of the range, there's twin-turbo 210PS putting out a lusty 450Nm of torque, but most versions of this car will be sold in single-turbo form where there are more modest outputs of 120, 150 and 180PS on offer. There's also the option of the brand's 'Intelligent All-Wheel Drive' system - which will be a welcome boon for towers who in this form can pull up to 2,000kgs. Petrol options include Ford's 160PS 1.5-litre EcoBoost engine and a 2.0-litre EcoBoost petrol unit offering 240PS. Self-levelling rear suspension is also available, while the optional 'Continuous Control Damping System' delivers a choice between Comfort, Normal or Sport driving modes. Adaptive electronic steering is also a standard fitment and includes the intriguingly-named 'Active Nibble Compensation' system that cancels out unwanted feedback, forces and vibration at the helm. The rear suspension is the same integral link set-up as seen on the latest Mondeo. It's good, in other words. 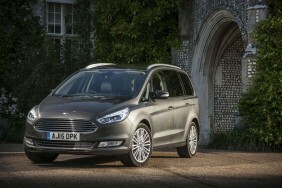 Ford has endowed the Galaxy with a very S-MAX-style front end, so you get that car's Aston Martin-style front grille, along with plenty of shape in the flanks to avoid that slab-sided look that makes so many large MPVs look like panel vans with windows. The old MK3 model wasn't a bad looking thing, but Ford has clearly decided to give the shape a little extra edge. As with previous Galaxy models, you don't get sliding side doors, but then that helps keep the side profile clean. The interior takes a step up in terms of perceived quality, with Ford offering a big 10-inch digital display and the excellent Sync2 infotainment system. There's certainly no shortage of space inside, with 40mm more headroom in the third row. A lot of thought has clearly gone into making the third row of seats something other than the most obvious short straw and they now get their own armrest storage and cup holders. You won't have to wrestle the seats up and down either. They can be raised from the boot floor at the touch of a button and both second and third rows can also be dropped flat from the front by using a console-mounted button. There's an additional 20-litres of stowage beneath the flat boot floor and the door bins are significantly bigger too. The entire of the Galaxy range meets stringent Euo6 emissions regulations and Ford claims to have improved the fuel economy of every version across the range. Expect mainstream models to give you well over 50 miles from a gallon of diesel and dip well under the 150g/km of CO2 barrier. In addition, buyers should get healthier residual values that they might expect from a Ford. Low-ish depreciation has long been a Galaxy staple, used buyers recognising its safety, durability and low ongoing running costs.